Click Here to view a Split Kit Table showing column size and split kit choice. Load bearing with options of fluted or plain. 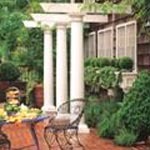 PermaCast & PermaLite fiberglass columns. Load Bearing. Split columns in Permacast are partially split for shipping integrity. Contractor to finish splitting on job. Masonite discontinues Hamel, Saddlebrook, 3PTX April 1st. Pricing error on HR312 in StairTrends corrected. ©2019 B&B Wood Products Inc, All Rights Reserved.